Charlie leaned beneath the rusted hood again. What genius unloaded this useless wreck on my son? Categories: age, car, humor, lifestyle | Tags: car, free, luck | Permalink. 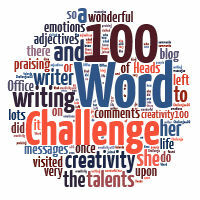 Barely home from China, and she’s already back in the swing of things with the 100-Word Challenge. 🙂 Nice entry! My head hurt as Charlie banged his. You definitely brought your writing talents back home with you Tess. Look at you just right back at it. You go girl! Hahaha! Poor boy didn’t know to look for an engine. Good job Tess!!! Maybe a newer model to start with? 😀 With all it’s parts? Oh right. Then it won’t be free. shakes head ..no it wouldn’t, good morning lovely lady. Lots of story in a scant 100 words. Very strong. Scrapyards are wonderful resources for parts but is the old rust bucket even worth the effort? Ha ha. Great! I pictured my father as the dad in this one. He smoked cigars and had that kind of attitude. Thanks so much, Geraldine. 😉 Means a lot to me. And Pop should cut Charlie some slack. At least the kid could get a few bucks for scrap. See what you can do in 50 words. Stirring. I love Julia’s challenge. She’s quite a character. If you planned your next trip to England, I think she’d be a kick to visit. And your story–wonderful surprise ending. Time away has blasted away some of the fatigue. Now all I need to blast away is this durn cold and bad sinus. Oh, no. I see above you have a cold and bad sinus. Take good care of yourself. Tom’s sinus infection (the 1st one) turned into bronchitis. Your flash is exquisite, as always. Lol! I certainly didn’t see that one coming. Sorry for the belated comment(s). Have been off WP for some time. It’s a real treat to have so many of your posts to catch up with now! Belated or not, nice to see you K. Hope life’s treating you well.